The US Department of Labor published Adverse Effect Wage Rates for 2019. AEWRs are the minimum wage that must be paid to H-2A workers and US workers employed alongside them, and are based on USDA's Farm Labor Survey that asks employers to report the average hourly earnings of their field and livestock workers. Employer-reported average hourly earnings rose six percent between 2017 and 2018, from $12.47 to $13.25, twice the three percent increase for private-sector nonfarm production workers. Average hourly earnings in California rose from $13.18 to $13.92, up six percent, the same percentage as in Washington and Oregon, where earnings rose from $14.12 to $15.03, the highest in the US. Average hourly earnings dropped slightly in Florida and in the Cornbelt states of Iowa and Missouri. There was a 23 percent jump in average hourly earnings in the mountain states of Colorado, Nevada, and Utah, from $10.69 to $13.13 an hour. The National Council of Agricultural Employers, whose 300 members employ an estimated 85 percent of H-2A workers, sued DOL to prevent the higher AEWRs from going into effect. 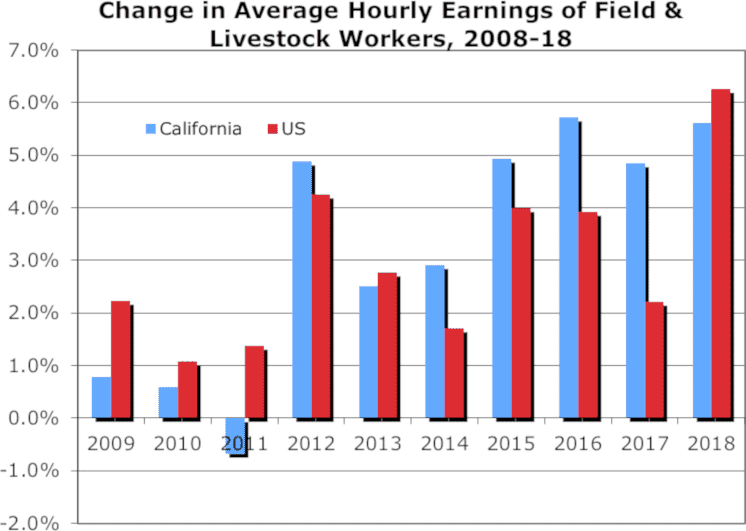 Over the past decade, the average hourly earnings of California field and livestock workers rose by 37 percent, slightly faster than the 34 percent increase for similar US farm workers. Most of this increase occurred since 2013; the rate at which earnings increased rose sharply in California after 2015.